I’ve been waiting for permission from Gourmet to share this recipe with you all, and I finally got it after WEEKS of waiting on a response! But I’m just glad I can share it with you. It is honestly my favorite salmon recipe and I have no idea why it is no longer found on their website or anywhere on the internet that I can find. It is super easy and elegantly simple. It is also the perfect way to use the plethora of cucumbers from my garden. I serve it with brown rice or quinoa and of course more veggies! One note on the salmon: use wild caught salmon versus farm raised so that you are getting the benefit of all the great omega-3 fats naturally found in salmon. In a resealable plastic bag, combine the soy sauce, garlic, lemon juice and sugar well. 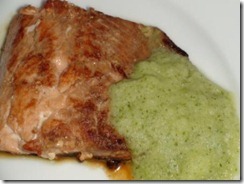 Add the salmon, coating it well, and let it marinate, sealed and chilled, for 30 minutes. Remove the salmon from the bag, discarding the marinade, pat it dry and press 2 teaspoons of the black pepper onto the skin side of each piece of salmon, coating it thoroughly. In a heavy skillet, heat the olive oil over moderately high heat until it is hot but not smoking and in it sauté the salmon for 2 to 3 minutes on each side, or just until it flakes. Transfer the salmon with a slotted spatula to paper towels and let it drain for 30 seconds. Serve with cucumber vinaigrette. Puree cucumber with vinegar in a blender until very smooth. Add sesame oil and blend until emulsified. Season with salt and pepper.